10 days separates us from Opening Day 2019. Teams have begun trimming the Spring Training rosters, minor league players are being reassigned, and the importance of each game is ratcheting up. A.J. Hinch, manager of the Houston Astros, has already begun to feel the reality of the upcoming season. 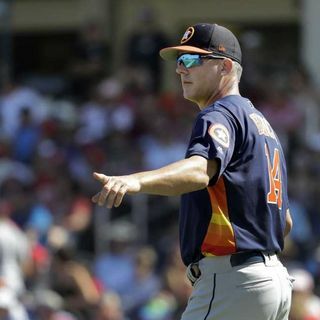 Hinch found himself ejected this past weekend, the first ejection of Spring Training, and had some things to say to reporters about umpire Angel Hernandez who ejected him. Was the villainous Angel ... Maggiori informazioni Hernandez in the wrong or did A.J. Hinch cross a line and try to carry it over to the regular season? Plus, reigning AL Cy Young Award winner Blake Snell has gone on record about his employer's, the Tampa Bay Rays, cheap treatment of him after winning the prestigious award. Is this another line in the list of poor decision made by the Rays ownership? Also, we promised it last week and here it is. Yule changes are coming to MLB over the next several seasons on top of the new rules being tested out in the independent Atlantic League the next 3 years. Which ones are good and which ones are bad? The guys have the answer. Finally, 4 teams down and 2 to go. The guys break down the AL West and lay out their projected standings. All that and more this week on Out of Left Field.